It’s Tuesday again and you know what that means! This week is dedicated to The Bard. I just adore Shakespeare and it was about that time to show it off, with other people’s tattoos lol! Literary tattoos are my all time favorite because literature means so much to me (I got my Bachelors in Secondary Ed- English). I feel like literary quotes can not only be deeply personal but also has the ability to share the commonalities of the many people who can relate to that quote/author/book or character. If you have any literary tattoos (or geeky tattoos in general) let me know so I can feature you, if you’d like in a future Tattoo Tuesday. What are your favorite Shakespeare plays? Some of my favorites are Hamlet, Richard III, Othello, Macbeth, A Mid Summer Nights Dream and Romeo and Juliet. If I start listing my favorite Shakespeare sonnets we’d be here all day! I haven’t read all of his plays, but a good portion of them. I do have his complete works and plan on getting it to once I get through this comic book binge that I’ve been on, if I ever get through it, which I probably won’t. "Rich gifts wax poor when givers prove unkind." - "Hamlet"
"Feather of lead, bright smoke, cold fire." - "Romeo and Juliet"
"I am not what I am" - "Othello"
"so long as men can breathe or eyes can see, so long lives this and this gives life to thee." -"Sonnet 18"
Megan Fox with "King Lear" tattoo, "We will all laugh at the gilded butterflies." 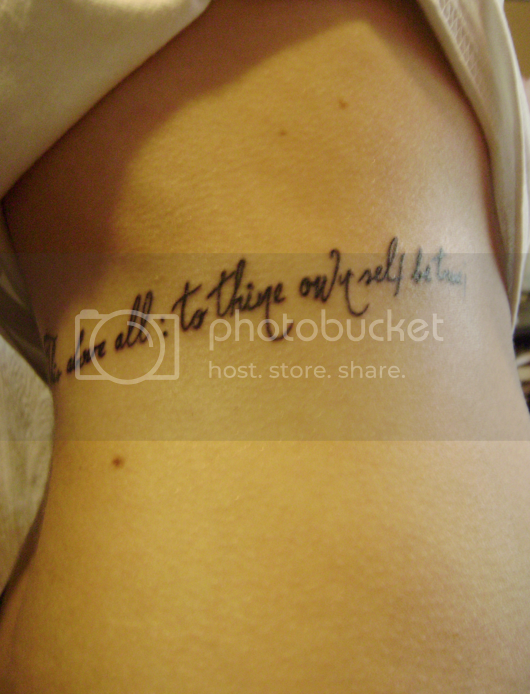 I love a well-chosen Shakespeare quote tattoo! Speaking of literary tattoos, I have on my forearm a tattoo that is a literary device from a play called “The Wisdom of Doctor Dodypoll,” which was printed in 1600 (same time Willy Shakes was writing). It sits on the last page of the play. I got it the day I passed my defense for my thesis for my Master of Letters in Shakespeare and Renaissance Literature in Performance, and I totally call it my “dork” stamp. Want a picture? Also, Macbeth is my favorite. Witches, ghosts, the mystery of fate, and murder. How can you go wrong?? How great I’d love to add it to the bunch!